I'm surprised it's actually taken this long but it's happening: a Pop! Vinyl Mega Man line is in the works. The above listing recently appeared in GameStop's catalog, well ahead of any official announcement from Funko or Capcom. 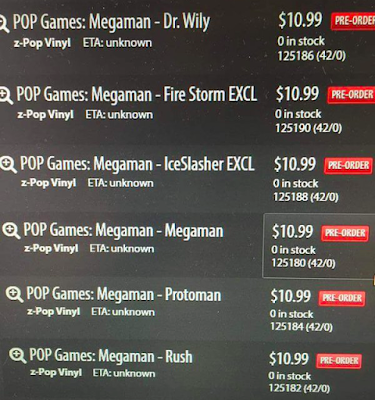 At least six figures will make up the line: Mega Man, Proto Man, Rush, Dr. Wily and two GameStop exclusive color variants, Mega Man Fire Storm and Mega Man Ice Slasher. The pair will be based off of Fire Man and Ice Man's weapon colors, respectively. Hopefully we're not too far off from seeing what these little guys look like. Stay tuned! You know, if Proto Man doesn't have the stupid eyes, this might be pretty cool. You do know that he'll most likely have his mask on so his eyes won't show. Funko Pop figures are notorious for having poor quality control. Bad paint jobs, parts falling off. No thank you. I have no clue what your talking about, they have great quality control, none of mine have broken, have bad paint jobs or anything else like that, I mean really that may be your experience with PoPs but for most people, myself included, they are fine. Um, it is actually well known now. Funko Pop USED to be good, but it's bad right now. Don't just buy online, go to a store and see for yourself. You can see the figures nicely stacked side by side and there are blatant inconsistency in paintjobs right on the shelfs. Paint bleeds are really not acceptable for that price. Unless you have a lenient collector's passing mark, there's no way this should be accepted. Funko pop USED to be good but once the demand went up they stopped doing quality control. Oh no, please no. Yes, Mega Man is a property that might actually work with the big-head-little-man style Funko does with their Pop! Vinyl series, but still. Those things are just horrible. About time! At least Pop! Vinyls are widely available, sometimes it's nice to have some desk accessories that aren't in the expensive "collector" import class. I may consider buying one of these. But unfortunately, like mega memer said, Funko Pop has some pretty spotty quality control. I'm aware of the inconsistency with the paint job for the figures, but this is the first time i've heard of parts falling off. I've avoided buying any of these, but I know I'll end up with at least a Megaman one. went into GS and pre-ordered them.